Gwrych Castle was built between 1812 and 1822 for Lloyd Hesketh Bamford-Hesketh. Various architects and designers were involved. The Craches had a hand in furnishing the interiors. Between 1909 and 1914, Arts and Crafts architect, Detmar Blow, in conjunction with Charles Ernest Elcock, added the famous yet theatrical Italian marble staircase and renovated the state apartments. During WWII, Gwrych was requisitioned by the Government and housed two hundred Jewish refugees. Leslie Salts then bought the building in 1948 and successfully opened Gwrych to the public for twenty years. 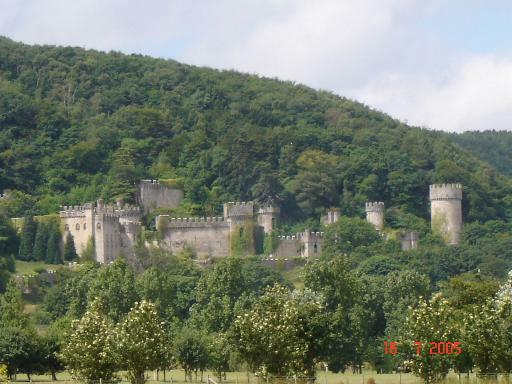 The Castle was nicknamed ‘The Showplace of Wales’ and attracted nearly ten million visitors. Between 1968 and 1989 the Castle had many owners and many different uses. Gwrych finally closed to the public during the winter of 1985, never to reopen. Up until 2005, the weather, heartless vandals and New-age travelers had looted and ravaged the building to the point of near dereliction. Recent photos make it clear that large parts are no more than roofless shells. Since then, there have been efforts to consolidate the building and the current owners hope to convert it into a luxury hotel. Always a pleasure to see articles raising awareness of Gwrych. Indeed there are plans to develop the Castle into a destination country house hotel, which are making good progress. I would however wish to point out an inaccuracy in your report, there are in fact no public rights of way over the Castle estate. All access routes to the Castle are in private ownership and there is signage advising of such at all entries. In 2003 whilst doing some training in the Welsh Valleys my friend and I on a spot of Leave decided to do a perusal of the said Castle, it was in a bit better nick then, from the we went for a walk up this hill that overlooked the Castle and came upon some old Caves, it seems so sad that dithere’s in the Council can’t pull their finger’s out of you knowwhere and do something before it’s too late,we never went back again a shame really.